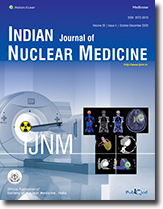 The application of incorporated beta emitting radionuclides in therapeutic nuclear medicine has recently shown extremely high potential both in the treatment of malignant and non-malignant conditions. In order to permit localization as well as quantification simulated skeletal phantom as well plexi glass human skeleton was used for the standardization and acquisition of bremsstrahlung images at various levels of 32P activities ranging from 0.75 mCi (27 MBq) to 2 mCi (74 MBq). The bremsstrahlung images obtained demonstrated good resolution and offers a potentiality in not only lacalization but also understanding the kinetics as well as dosimetry of incorporated beta emitting radionuclides. Scintigraphic evaluation of lymphomas with Gallium67 (Ga-67) pre & post-therapy is well-established procedure. Other agents employed include 18 Fluoro Deoxy Glucose (FDG) and Thallium chloride (Tl- 201). However Ga-67, 18FDG and Tl-201 are all cyclotron produced and are not readily available in developing countries like India. In this context assuming similarity of behavior with the myocardial perfusion scanning agent Tl- 201, the newer Technetium-99m (Tc-99m) labeled myocardial perfusion scanning agents have been studied in imaging of various tumors. Methods: 13 patients of lymphoma -Hodgkin's disease (HD) and Non Hodgkin's Lymphoma (NHL) in various stages were studied. Tc-99m Tetrofosmin (Tf) (Myoview-source Nycomed Amersham Pic, England was injected intravenously and static images of the involved site were taken at 5 minutes, one hour and again at 24 hours. Static images of the skull, chest, axillae, abdomen and pelvis were acquired at 30 minutes. Subsequently 5 patients were studied with Ga-67. The images were compared. Results: The total number of clinically involved sites in 13 patients were 75 and 99m Tc-Tf uptake was seen in 16 sites only (20%). Of the 5 patients who had both the studies the total number of clinically involved sites were 25. 99m Tc-Tf uptake was seen in 8 sites whereas Ga-67 uptake was seen in 11 sites (44%). 99m Tc-Tf uptake in abdominal sites was masked by hepatobiliary excretion Conclusion: Ga-67 is superior to 99m Tc-Tf in imaging lymphoma. Aim: It has been stated that nitrate augmented 99m Tc-Sestamibi bolus injection is almost comparable to 24- hour reinjection of Tl-201 for the detection of myocardial viability. This study was aimed to see if nitrateaugmented infusion injection of 99m Tc-Sestamibi can reveal more areas of viable myocardium as compared to the standard stress rest protocol of 99m Tc-Sestamibi and nitrate-augmentation. Materials & Methods: 25 patients (all men) with a mean age of 42.72 yrs (age ranging from 28-57 yrs) with a recent history of myocardial infarction (3 weeks to 6 months) were included in the study. A routine stress - rest myocardial perfusion scan with 99m Tc-Sestamibi was performed on these subjects. The rest study was augmented with 10 mg of nitroglycerin sublingually. These subjects were given the same dose of nitroglycerin and 99m Tc-Sestamibi two days later. 99mTc-Sestamibi was given as an infusion over a period of 45 minutes and images were obtained after one hour. 17 segment myocardial model was taken for analysis and a total of 425 segments were analyzed out of which 176 segments were for viability evaluation. Results: In resting images obtained with MIBI bolus injection, there was improvement in 17 segments (9.6%) when compared to the post stress images and in images obtained after infusion, there was improvement in 34 assessed for viability segments (19.3%). In the remaining segments, there was improvement in 48 segments (19.27%) in the images obtained with MIBI bolus injection and improvement in 85 segments (34.13%) in the images obtained with MIBI infusion. Conclusion: This study shows that nitrate augmented MIBI infusion is helpful in detecting more areas of viable myocardium when compared to the standard resting study following bolus injection. Thymoma is a rare tumor entity. However, it is the most common neoplasm of the anterosuperior mediastinum and the most common primary tumor of the thymus. Seventy percent of thymomas are found in adults in the 5th and 6th decades of life, being rare in children and young adults. There is an approximately equal overall gender ratio. The majority of thymomas are found in the anterior mediastinum. Other locations may be the neck and posterior mediastinum. Most of them range from 5 to 10 cm in size. The authors present an interesting image which was incidentally detected on a Tc-99m Tetrofosmin cardiac perfusion scan and was later proved to be a mediastinal thymoma on histopathology. The author's report a case of fused pelvic kidneys detected on ultrasonographic examination referred to our department for diuresis renography to assess renal dynamics and exclude the possibility of urinary tract obstruction. Renal scan demonstrated a fused pelvic mass with an hourglass configuration functioning normally without obstruction. The authors present this case to depict the Hourglass Sign found to be associated with fused pelvic kidneys. A 39-year-old lady with carcinoma breast (stage T3 N1 M) had a bone scan to rule out osseous metastases. There was abnormal focal tracer concentration seen in the region of transverse process of L5 vertebrae on the right side. A repeat spot image of the pelvis done 24 hours later, revealed no abnormal tracer concentration in the above region. We conclude that additional delayed image may be required in such situation. We report a case of solitary thyroid nodule which was treated with suppressive L-thyroxine therapy and resolved completely.